"We need to help..." were the words James Parsons would say most often. James, who started Blessed Family Street Ministry, helped the needy and homeless in Omaha for many decades, especially homeless women and children. James passed away on June 29, 2018. For an article about James, please click on this link: James Parsons . On countless occasions, Assumption-Guadalupe Catholic Church and James worked together to help the needy and homeless in the South Omaha area, and beyond. The money raised with this fund will be in James' memory, with 100% of the funds raised going directly to the needy and homeless, through Assumption-Guadalupe Catholic Church's Family Assistance Fund. James was well-known for handing out lunches to the needy each weekday. 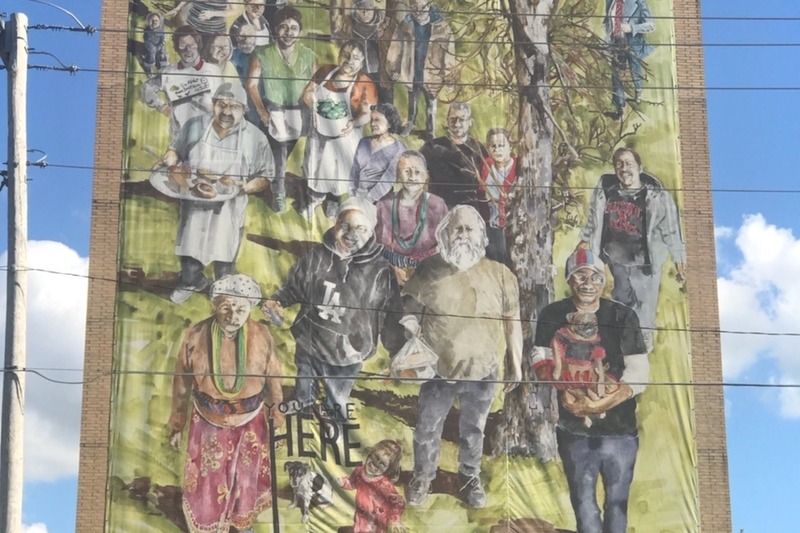 Wearing a t-shirt, blue jeans, and a white beard, James is depicted in a mural (towards the bottom), where he is holding a bag with a lunch inside. The mural can be seen on the north side of the building on Park Ave and Woolworth Ave.
May James rest in peace. And may we recognize when "we need to help..."